Public speaking is all about confidence. Anyone who’s taken as much as an undergrad speech class could tell you that. Sometimes one person, perhaps a good friend or simply a good person showing interest in getting to know the real you can make all the difference in the world. But that can also mean giving in to the vulnerability of lowering your guard and going outside your comfort zone. That’s essentially what The King’s Speech is all about. Its focus is the unlikeliest of friendships that serves as a slap in the face to Judd Apatow, Todd Phillips and everyone else trying to make a good bromantic buddy comedy these days. Funny, touching and inspiring, This King’s Speech is the rare period piece that should never be mistaken for dull Oscar-bait. This unlikely duo is formed when the future Queen Elizabeth (Helena Bonham Carter) seeks out the help of Lionel Logue (Geoffrey Rush) a peculiar speech therapist after exhausting all other options for her husband’s life-long stammering problem. Elizabeth (Helena Bonham Carter) and therapist Lionel Logue (Geoffrey Rush) deliver the first of the screenwriter David Seidler’s many memorable exchanges with royal comedic timing when she shows up on his doorstep to enlist in his services. A very particular teacher with a specific set of rules, Logue ultimately decides his rules can be bent for such a high-profile client. Rather than engaging in technical exercises, Logue tries to get to the root of the problem. A recording he makes of the Duke of York perfectly reciting a verse of Shakespeare while listening to music through headphones proves they’re dealing with a psychological issue. 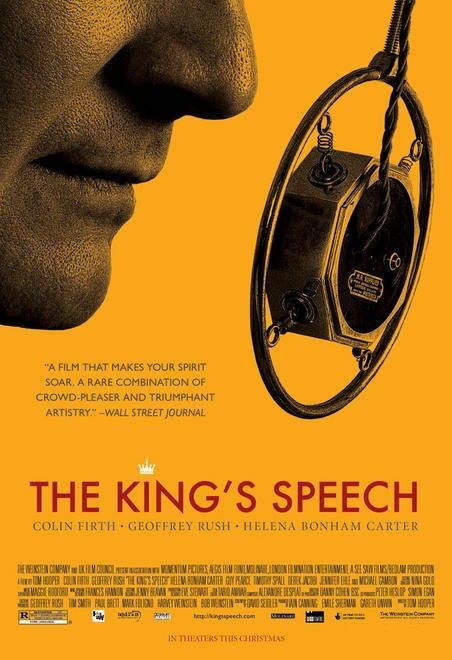 Colin Firth’s sublime performance as King George VI, or Bertie as Logue so affectionately calls him, is the film’s centerpiece, but most of the drama involves those around him. George’s ascension to the throne is an abrupt one. His older brother Edward (Guy Pearce) takes the throne after the death of their father (Michael Gambon), only to abdicate it shortly thereafter when he decides to marry a twice-divorced American woman. The uber-traditional royal family would never stand for such a thing. George may have been strapped with a responsibility he didn’t want, but Logue is determined to make him prove he’s worthy of it. And that begins with proving it to himself. He must win this battle within himself if he hopes to deliver a speech that will lead the nation into a second World War. Director Tom Hooper (The Damned United) stages this scene with all the intensity of a heavyweight title fight. The King’s Speech is similar The Queen in taking a microscopic look at a single important figure during a pivotal time in England’s history. They’re character pieces that feel like they’re hidden inside broader period epics. These personalities place the weight of an entire nation, desperate for guidance, firmly on their shoulders. Helen Mirren took home an Academy Award for her performance in The Queen, and I suspect Firth will be doing the same for his brilliant work here. He’s such a natural performer that his stammer never feels like an act.